On Saturday afternoon I headed to the local branch of Bank of America, hoping to get there before it closed. I made it in plenty of time—with half-an-hour to spare. I was somewhat surprised to see an armed security cop standing outside the entrance. Feeling awkward walking by someone whose license to carry arms is so obvious, I said hello as I passed him. With his arms folded across his chest, making the revolver on his right hip stand out as an asymmetrical accessory, he gave me a perfunctory nod. As the only customer inside the branch, I took care of my business easily. I couldn’t help but remember years gone by when there would have been a line of people rushing into the bank before it closed for the weekend. I am so happy for the transactional ease of ATMs. As I pushed the door open and stepped into the sunshine, I noticed the guard had moved about a foot closer to the door, positioning himself as if ready to open the door for customers. But . . . he clearly wasn't (nor should he have been) on door-duty. Walking toward my car, I fumbled with the receipt and manager’s business card that I'd be needing in a few days’ time. I wish I had a paperclip, I thought, as I stepped off the curb and into the parking lot. Ah, wait—I think I saw one on the sidewalk by the bank. I turned around and—because I didn’t want to make the guard nervous (I could be an old lady criminal, after all)—began to explain myself. “Uh, I just realized I saw a paperclip here somewhere—it’s exactly what I need to keep my papers together,” I said rather self-consciously. I spied it and stooped to pick it up. “It’s been there since Tuesday,” he said. Four days? I cannot imagine standing in one place for eight hours, all the while hoping that what you were there for wouldn't happen (or maybe hoping it would). 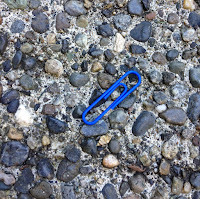 The idea of staring at a paperclip, noting its presence but doing nothing about it, is puzzling to me. If a brightly colored item hadn't seen as reusable, why wasn't it perceived as trash? Perhaps that's the philosophy of the cop—leave well enough alone. Probably a good thing, actually. But four days? One little paperclip became a giant eye-opener. He's a Poet, and Don't I Know It! Falling in love with a poet . . .well, not that kind of love. 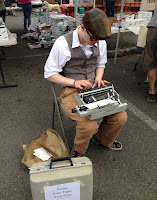 But I’m definitely smitten with the idea of a busker-poet, and the image that a certain young man projects as he sits at the Lake Forest Park Farmers’ Market to create poems on demand. C. Stavney has been at the market for its startup at ten o’clock almost every Sunday this season (May - October). 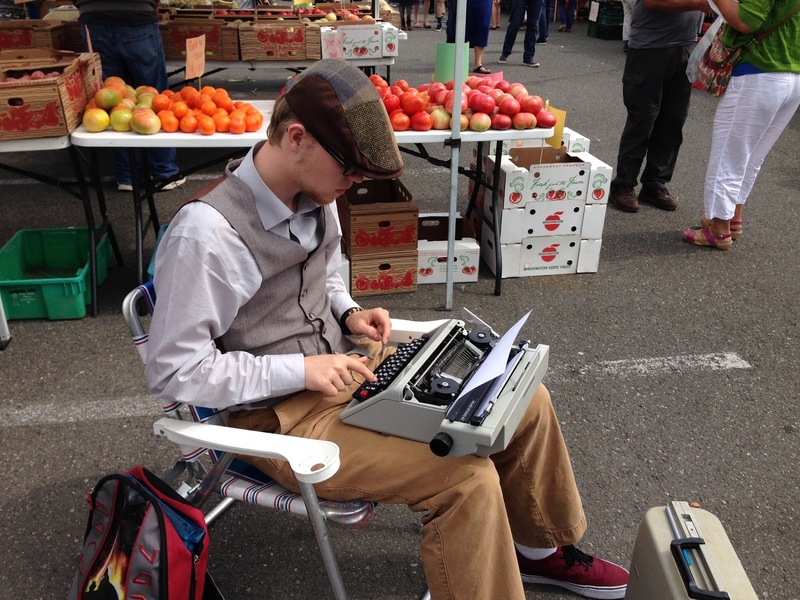 After he learns his assigned location from the market manager, he sets up shop with just two props: a backpack full of paper and his typewriter. Wearing a version of the same outfit every week—a jaunty combination of brown tones that becomes him—he writes poems on whatever topic you want. He is amazingly gifted. Shoppers at the busy farmers' market wander by his chair. Some point at him; some read his sign and giggle; some stop and talk. Children love him, crowding around to see the keys of the typewriter move up and down. The lucky people who decide to become customers can offer topics, words, or occasions to write about, or they can describe a situation that begs for a poetic take. Whatever he gets as a ‘poem seed’ appears to immediately inspire him. He removes a sheet of paper from his backpack, rolls it into the platen of his small manual typewriter, and begins to write. Last Sunday a large contingent of Taiko drum students beat rhythms as impossible to ignore as fireworks. But even that didn't appear to daunt him. He works among the sounds of tantrum-y children, yipping dogs, and the excessive chatter filling the deliciously fragrant air. Nothing appears to derail Mr. Stavney's creativity. 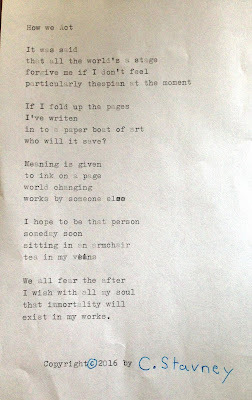 He types away and within just a few minutes, pulls the poem out of the typewriter, signs his name to it in light blue ink, snaps a photo of it with his cell phone, and hands it to his customer. His sign (taped to his typewriter case) announces that he will write a poem for any price and reminds his customer (in parenthesis) that ‘free’ is a price. in Lake Forest Park, Washington. I am so impressed with his gift for words and his edgy, sensitive take on the various topics of poems, I contribute to his "kitty" each week—even if I haven't needed a poem. Lately I confess to wondering, when don't I need a poem? He has managed to fold me into the bosom of the human race a little tighter with each of his works. (I’ve purchased a total of six this summer, and when possible I've drummed up a little business for him from market shoppers wondering 'if he's any good.') The produce vendor in a booth near Mr. Stavney's chair told me that he and his girlfriend loved the poem he wrote for them so much they’d be framing it. Good plan! Last weekend I jokingly threatened to reenact the story of Rumpelstiltskin by trying to guess his first name. And I did! But I won’t share it; he admits he withholds it to establish market mystique. I think his gift is all the more remarkable for his age, and the University of Washington must agree with me because I also learned he'll attend the U.W. this fall as an upperclassman English major. The UW is a stickler of a school to be accepted to, and he's not yet twenty years old (is actual age is another piece of his mystery). 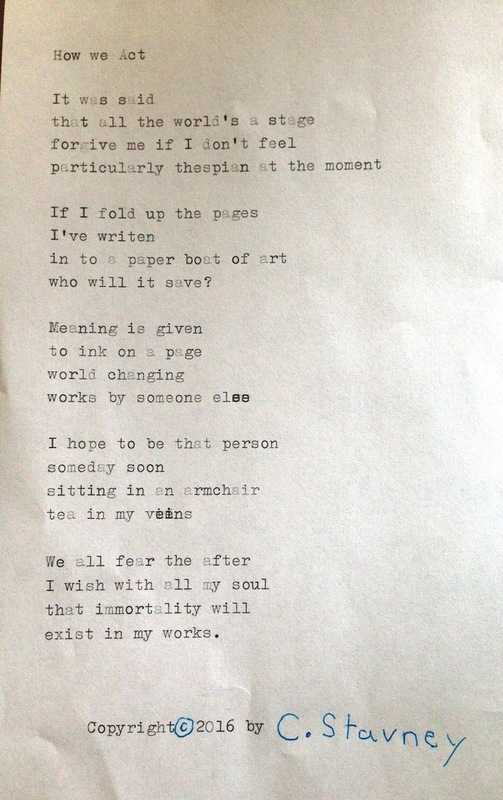 Today I told him I was going to write about him on my blog and asked for a poem I could 'publish' here. I proudly use it with his permission. When Mr. Stavney is famous, I'll boast that I was his patron“back when” he was busking his poetry at the Lake Forest Park Farmers’ Market.